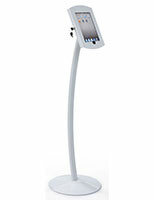 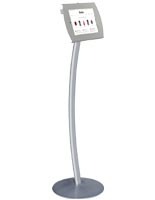 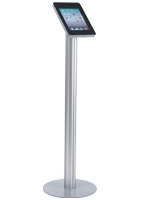 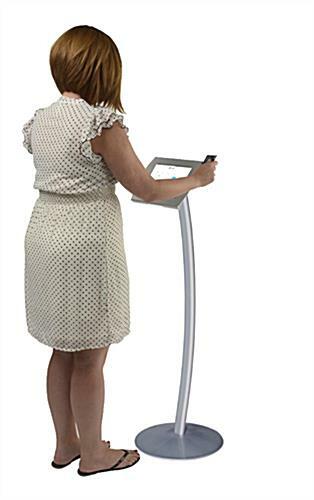 This commercial iPad tablet kiosk features a sturdy aluminum base with curving pole and a steel device enclosure. 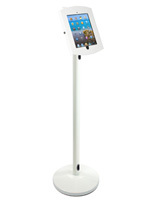 Designed for public access, the locking fixture offers free access to the home button, camera and charging ports. 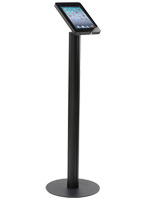 This versatile silver-finish iPad tablet kiosk also comes with a bracket for Square® credit card readers. 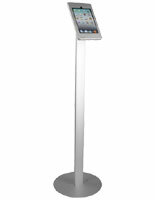 The floor standing enclosure stands 45.5" tall, with a round base for stability in high traffic areas. 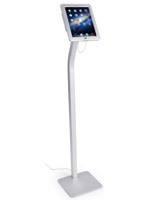 The user-friendly iPad tablet kiosk with card reader & Home access allows installed devices to tilt and rotate as needed for visibility. 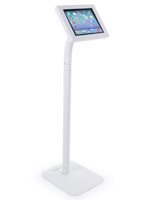 The stylish touch screen enclosure is ideal for in-store or trade show use and will complement any environment.